The Moon is a constant in our lives, always pointing the same face towards us due to its tidally-locked orbit around the Earth. It's therefore counter-intuitive to think that it may have rolled over at some point in the past. Yet, new evidence suggests that the Moon was indeed subject to a catastrophic event of such proportions that it was tipped over from its original axis. "Many of the data points clustered at the current pole. But a second set clustered well away from there, somewhere between 45 and 60 degrees from the existing pole. Although the Earth has experienced some degree of polar wander, the pole has always made a gradual track as the Earth's angular momentum shifted. Here, it appears that the Moon made a sudden jump, as there are no indications of gradual track between these two locations. These findings support earlier findings of non-random clustering of craters on the lunar surface, indicating that perhaps the Moon was whacked by something BIG in the past. I suspect that, as ever with the timing of such events, it seems likely that such an event would have been coincident with the so-called 'late, heavy bombardment' 3.9 billion years ago. This enigmatic period of cosmic blitzkrieg occurred sometime after the solar system settled down from its early, chaotic period - meaning that something untoward entered the frame at that time. 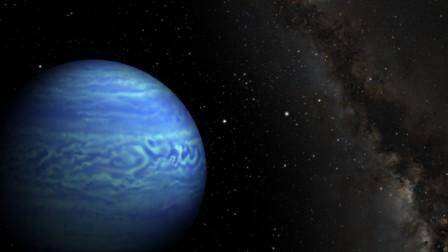 Many theories abound - migrating gas giants, rogue planets, comet swarms of unknown provenance. From a Sitchinite perspective, this is all very revealing. After all, in the cosmology described in the epic poems of the Sumerians, as interpreted by Zecharia Sitchin, the Earth was once a much bigger, watery world known to the ancient Mesopotamians as Tiamat. Tiamat had a single, but highly significant Moon, Kingu. Both were in the line of fire when the rogue planet Marduk appeared in the solar system, with the catastrophic encounter resulting in the fracturing of Tiamat to leave a belittled Earth, as well as formation of the asteroid belt. Earth and its now comparatively oversized companion Kingu were blasted into a closer orbit around the Sun, leaving the trailing belt of asteroids as sole evidence of the event. Except...perhaps now we can see another way in which Marduk affected the ailing Earth/Moon system, as the Moon also appears to have rolled over during the furore. Given the description of the catastrophic Earth/Moon migration, one can hardly be surprised that they rolled over as a result! Indeed, perhaps the Earth's cyclical swing of its magnetic poles might also be attributable to a past rolling movement of its core, which was set in motion during that tumultuous event almost 4 billion years ago. 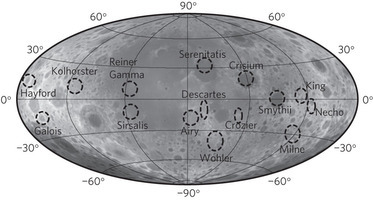 Names and locations of magnetic anomaly regions are indicated by the labelled ellipses, overlain on a lunar topography map drawn from Kaguya Laser Altimeter data (2). Astronomer Kevin Luhman has announced the discovery of a 3-10 Jupiter-mass (3-10 MJ) sub-brown dwarf located just over 7 light years from the Sun. This new neighbour (the short name for which is WISE 0855–0714) was found by comparing two infra-red sweeps of the sky by the infra-red space telescope WISE (1). It was found to have a very high proper motion across the sky. Further studies of this Dark Star object, whose relatively fast movement across the constellation Hydra indicated that it must be a neighbour of the Sun, have shown it to be seriously cold for a brown dwarf-type object at just minus 48 to minus 13 degrees Celsius (2). ""This object appeared to move really fast in the WISE data," said Luhman. "That told us it was something special." The closer a body, the more it appears to move in images taken months apart. Airplanes are a good example of this effect: a closer, low-flying plane will appear to fly overhead more rapidly than a high-flying one. "WISE was able to spot the rare object because it surveyed the entire sky twice in infrared light, observing some areas up to three times. Cool objects like brown dwarfs can be invisible when viewed by visible-light telescopes, but their thermal glow -- even if feeble -- stands out in infrared light. Could it actually be closer to the Sun, but having a more substantial vector of travel along the axis between this Dark Star and the Sun? In other words, could the lateral movement across the sky, as fast as it is, be just part of its overall motion, leading astronomers to think this object is further away than it really is? Unfortunately, it seems unlikely, as intensive studies of this object by Kevin Luhman and his team have indicated a significant parallax effect, providing a small margin of error for the calculation of its distance from the Sun (4). You know, these objects keep on popping up, years after WISE completed its actual survey. There seems plenty of scope for other exciting discoveries in our galactic neighbourhood, or even our own backyard. A remarkable step forward in under understanding of genetics (1) has flung up some potentially useful ideas about how the Anunnaki might have altered the genetic code of our long-distant ancestors, creating modern humans. Essentially, humans, Neanderthals, Denisovans, Homo Floresiensis, and goodness knows whatever human-like species may yet appear, carry much the same genetic code in the form of the humanoid genome. But various parts of that genome are switched on and off, creating patterns which are known as the epigenomes. Again, these vary within any given species (leading to variability in characteristics, capabilities and genetic vulnerability to disease), but that variability of genetic patterns is far greater between species( e.g. between humans and Neanderthal), even though their overall genomes are very similar to one another. So, in a Sitchinite sense, the overall humanoid genome was the lump of genetic clay out of which each of these species may have been moulded. 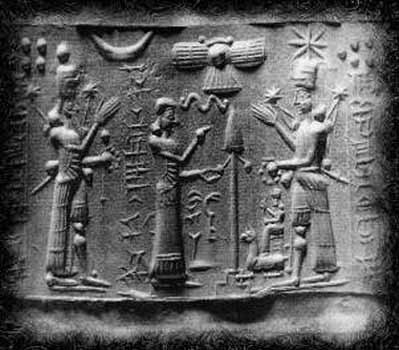 By turning off various patterns of the genome, which is essentially derived from themselves, the Anunnaki were able to tailor the perfect slave worker for any given environment - whilst rejecting the scores of 'duds' that resulted from Enki's experimentation in epigenetics. This makes more sense than trying to understand why each species would individually evolve through natural selection a genome that has a wide series of unused (switched off) genes, which bear a remarkable resemblance to those of other humanoid species that have made use of them, but which were derived from a separate lineage of evolution. One has to ask oneself, why would natural selection cultivate genes that aren't going to be used? Sitchin's solution makes more sense. Another point - perhaps there are series of genes in the human, Neanderthal and Denisovan genomes that are common to all, but are ALL switched off. Those genes would be the Anunnaki genes that they would rather none of their slaves have. Including, of course, incredible longevity. The longevity question might also be answered by another point in the article - that some illnesses are triggered by switched-on genes ramping up the body towards various diseases. Again, these may be artificially imposed limits on human life-spans which we might find the way to switch off over time. Either way, from a Sitchinite perspective, Science might be knocking on the door of ancient secrets, the unravelling of which may bring the opportunity to understand how to greatly extend our life-spans. 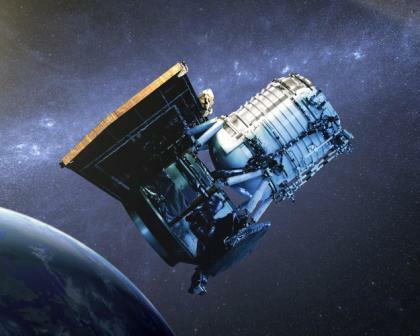 "NASA has denied funding to an idea to use NEOWISE image exposures for additional processing for science purposes, according to Amy Mainzer, the deputy project scientist for the Wide-field Infrared Survey Explorer (WISE) at NASA’s Jet Propulsion Laboratory. The project, called MaxWISE, was supposed to run for three years and to use NEOWISE data for other purposes. One would have thought that gaining knowledge about the Sun's galactic neighbourhood would have been a useful bit of science. As has been seen on the item above, new neighbours are being added to our local map even now - using WISE data scoured over by academic astronomers - and it seems highly likely that other exciting discoveries remain to be made. The thing about WISE is that it has a finite shelf-life. The fact that it is still usable at all is pretty amazing (and a testament to the team behind this infra-red space telescope), and so any opportunity to squeeze new science out of it should surely be a priority over missions which are not so time-limited? Apparently NASA don't see things that way; opting for a basic cost/benefit analysis to make their decision. In this age of public austerity, they have to make tough decisions, it's true, but any proposal that aims to squeeze just a few dollars more of data out of WISE before it packs up completely should surely be worth the investment? It'll be many years before NASA, or anyone else for that matter, contemplates building another Infra-Red survey scope in space. After all, it was a good 3 decades between IRAS and WISE! "Other such mysterious lines have been recently discovered in the Middle East, stretching from Syria to Saudi Arabia. 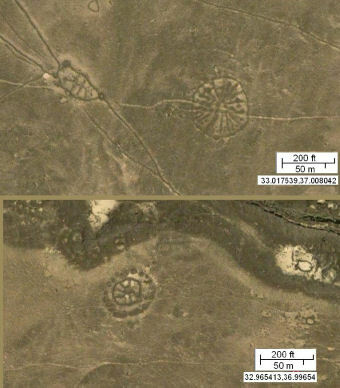 Virtually unknown to the public, these geoglyphs, as described in the LiveScience article... by Owen Jarus , are at least 2000 years old and appear as wheels; stone structures in a variety of designs that have a common theme of a circle with spokes radiating inside. many were created on lava fields and measure up to 230 feet across. The Jordan region alone contains more stone-built structures than the Nazca Lines, covering a far more extensive area, according to David Kennedy, professor of classics and ancient history at University of Western Australia. The first was for a forthcoming DVD release about the Anunnaki, entitled "Anunnaki, Origins of Man" which will feature other prominent alternative researchers. I travelled up to Manchester for the interview. 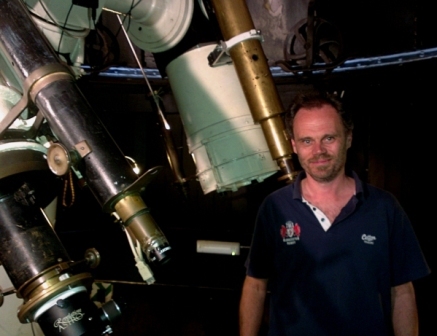 The director, Chris Turner, had organised the perfect venue - inside the historic Godlee Observatory at the Sackville Building at the University of Manchester. As you can see from the image (right), the darkened dome's interior created a wonderful atmosphere for the shoot; and our host at the observatory, Tony Cross, provided us with illuminating insight into the working of the old telescopes, as well as plenty of outrageous anecdotes! The interview went very well, and I'm really looking forward to seeing what Chris and his team come up with. It's going to be a rare treat for anyone interested in the writing of Zecharia Sitchin and the search for Planet X. Other contributors to the DVD will include David Icke, Sasha and Janet Lessin, Bill Ryan and Michael Tsarion. My old mate Simon 'Geordie' Faulkner decided to chance his hand at the MCM Comic Con Sci-Fi convention in Birmingham (the one with a silent 'H') last month. With the help of Ali and Whizz, he knocked up a pretty respectable cloak and attended as the Emperor from Star Wars. Well, he became an immediate attraction at the event, and had a host of photos taken alongside all manner of Star Wars characters. Many of them, it turns out, belong to an undoubtedly geeky but rather superb brotherhood known as the UK Garrison. Their members can only dress up in absolutely authentic Star Wars costumes, and en masse they appear at all kinds of gatherings - with the proceeds going to charity. Now, my friend Simon's costume was more 'knocked-up-in-my-shed' than any kind of official outfit, but despite this the chaps and chapettes of UK Garrison present at Brum's NEC turned out 'in force' to make this totally cool photo. It has since appeared on countless websites. Simon is now contemplating getting himself wardrobed up properly, perhaps as one of the Death Star officers, and joining the 'outfit' - all for a good cause! 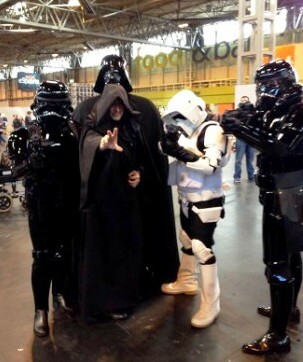 He was not the only member of the Dark Star Clan appearing in costume at the convention. Dark Star Bro, also known as Dr Mikey, wore his new hand-crafted Hawkeye costume for the first time; and Whizz clad herself in tight leather, presumably to emulate some sci-fi character or other (or maybe just because...?). And me? Well, there was a time, Mrs Dark Star says, when I might have made a pretty good Chewbacca. But sadly, male pattern balding has seen to that dream and the way things are going I'd more likely end up as that baldy bloke from Bespin with the headgear fused to his skull. In my February 2014 blog, I discussed the fairly widespread flooding that had occurred in southern England, and highlighted the issues very close to where I live in the River Severn valley. To re-cap, housing pressures in southern England are acute, and the traditional 'Green Belt' land is being gradually encroached upon by developers. In this area, there is a significant flood plain that extends up to a mile or so from the Severn, which is Britain's largest (and sole tidal) river. Most of the time, that flood plain is beautiful countryside. Occasionally, it is several feet deep in river water. Some areas of Longford, to the north of Gloucester, are highly prone to flooding. The land around the village, which is semi-detached from the rest of the city by the northern bypass, is relatively cheap, flat and therefore very vulnerable to housing developments. And guess what? Construction of almost 600 houses has now begun (see image opposite, taken 24/4/14), just 3 months after the last flood brought Prime Minister David Cameron to the Queen's Head pub for a chat with concerned locals. So, that really worked then... These fields may not be the worst parts of Longford as far as flooding goes, but concreting over these areas impedes natural drainage and thus displaces water directly towards the main river area - thus exacerbating the problems elsewhere in the area. As I discussed on BBC Radio 4 in February, no one wants to see pretty Cotswold towns and villages becoming swamped by new modern housing estates up in the hills. But if flooding is going to be a worsening problem, does it really make sense to continue building sizeable housing developments across the floodplain? So, a friendly word of advice to people thinking of buying a house in Longford's controversial new "Whittington Park" development: As flooding issues continue to present Britain with worsening problems in the years ahead (as most meteorologists seem to expect), then issues to do with flood insurance will also become more troubling, especially for anyone living in certain flood-prone postcodes. Think long and hard about it, and make sure you pack your wellies!